I had a recent need to examine some php pages that were used to compromise a web server. Several of the php pages were obfuscated using base64 encoding to avoid detection. 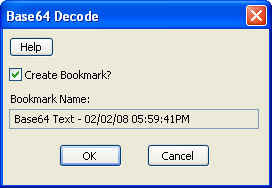 Therefore, I needed a quick way to decode base64 text and then bookmark the decoded text for later review. Once the EnScript is completed, you can check the console tab for the decoded text as well as look at the bookmark if you chose that option.